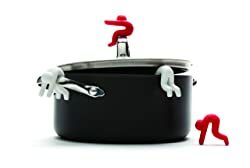 For the crazy busy holidays or any occasion, these inexpensive kitchen gadget gift ideas will help you shop faster. Most gadgets on this page sell for less than $20, and none of them are priced higher than $50. While we tend to focus on the practical, we couldn’t resist including a few on the whimsical side because they’re more than just cute – they’re actually useful! Need More Kitchen Gadget Gift Ideas?